In a burial chamber deep within a South African cave system, a team of scientists has discovered 15 partial skeletons — of a completely new human-like species. The discovery, announced this morning by researchers from University of the Witwatersrand in Johannesburg and published in the journal E-Life, adds a completely new section to the Homo family tree. 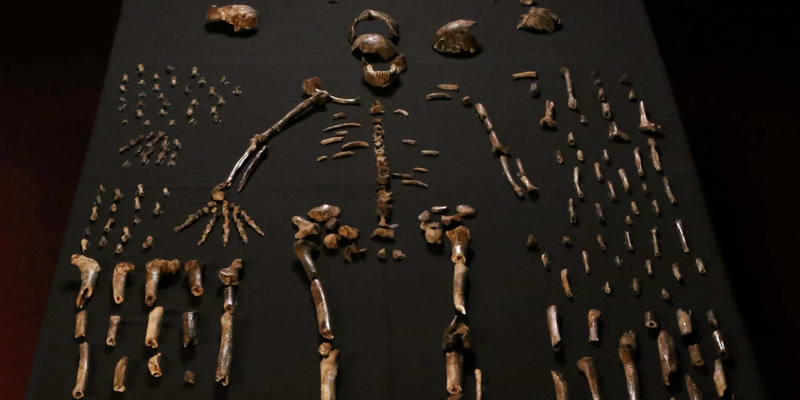 The researchers have dubbed the new species Homo naledi. While Lee Berger, the lead researcher behind the study, tells New Scientist that the species “doesn’t look a lot like us,” his team believes that features observed in the skull, hands and teeth of the skeletons make it part of the Homo genus. They certainly have enough evidence from which to draw that kind of conclusion: the fossil find in the cave system was particularly rich. In fact, the team uncovered an amazing 1,400 bones and 140 teeth during a single field trip to the site. The team reckons the fossils could date back as far as 3 million years — though an accurate date is yet to be confirmed. Such a large find in a single location is pretty much unheard of in discoveries of Homo remains that are so old. The sheer number of bones found together suggests that the bodies may have been deliberately left in the cave, which in turn hints that primitive humans may have buried their dead. While further investigation is needed, the finding could change the way we think about ancient human behavior. Berger claims that thousands more remains are still present in the cave. Rather than digging them all up in one go, though, a decision was made to take the current batch up to the surface and then create a larger-scale project to uncover the rest over the coming years. The remains that have so far been studied suggest that Homo naledi was an unusual-looking creature. Its pelvis and shoulder are, apparently, reminiscent of apes that lived 4 million years ago, while its feet resemble Homo sapien remains from just 200,000 years ago. Meanwhile, its skull was much smaller, containing a brain less than half the size of modern humans. The team reckon the creature could have stood 5 feet tall and weighed almost 100 pounds. That doesn’t detract from the importance of the find, though. While more work is clearly needed — to accurately date the finds, to excavate the other remains, to work out in more detail what we know about Homo naledi — the possibilities provided by such a large collection fossils is huge. Perhaps most importantly, the find serves to remind us that the soil still have plenty of fossils to offer — and in turn plenty to teach us about the rich history of our ancestors.